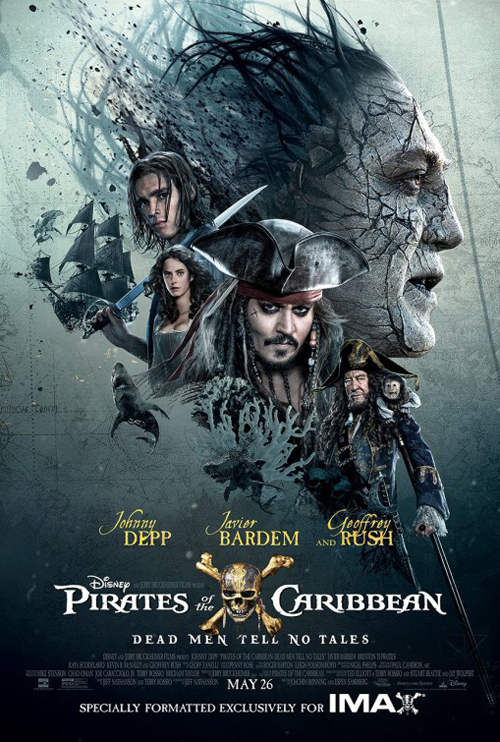 (SPOILERS) The biggest mistake the Pirates of the Caribbean sequels have made is embracing continuity. It ought to have been just Jack Sparrow with an entirely new cast of characters each time (well, maybe keep Kevin McNally). Even On Stranger Tides had Geoffrey Rush obligatorily returning as Barbossa. Although, that picture’s biggest problem was its director; Pirates of the Caribbean: Salazar’s Revenge has a pair of solid helmers in Joachim Rønning and Espen Sandberg, which is a relief at least. But alas, the continuity is back with a vengeance. And then some. Why, there’s even an origin-of-Jack Sparrow vignette, to supply us with prerequisite, unwanted and distracting uncanny valley (or uncanny Johnny) de-aging. The movie as a whole is an agreeable time passer, by no means the dodo its critical keelhauling would suggest, albeit it isn’t even pretending to try hard to come up with something different. Animosity towards Johnny Depp has now reached such sustained levels that any new announcement of his casting is greeted not only with disdain towards his eccentric performance shtick but also accompanying judgements regarding the allegations made by his ex and a profligate lifestyle that makes Nic Cage look frugal; it seems he has been forever sullied, so therefore ripe for rehabilitation over the next five years or so. In the meantime, he’s hopping about projects, hitching his cart to Fantastic Beasts and Where to Find Them, Universal’s Dark Universe (as The Invisible Man, if the touted franchise gets that far) and various dark side turns in LAbyrinth and King of the Jungle; where his Thin Man remake is currently, I don’t know, although maybe playing another cheerful inebriate right now wouldn’t be the most considered of options. I can’t say I’ve really been on board with the general acrimony towards his performances. Sure, there’s the occasional stinker (his Mad Hatter is as misjudged as his Willy Wonka), and his Fantastic Beasts cameo is mainly notable for retrospectively doing a disservice to Colin Farrell’s performance, but he still has his comic chops about him (I liked Mortdecai, for the record), and thus Jack Sparrow is still, largely, an entertaining character, all ifs allowing (if you can bear to watch a movie now with Depp without moral reservations, if you don’t find his ham insufferably old, if you don’t find the character about a decade past his sell by date). Whether he’s robbing banks (ingeniously but badly; the elaborate set piece is both ludicrous and impressive), facing the guillotine (the revolving see-saw effect is a lovely piece of comic inventiveness), simply pratfalling over a fence, or commenting on the soppy reunion of pure hearts (“What a truly revolting sight”), Sparrow can still elicit a chuckle or even a guffaw; Depp’s timing hasn’t yet deserted him. If he brings a modicum of broad wit, however, much of the rest of the dialogue is unable to pass muster. An extended riff on the definition of horologist begins amusingly enough but is indulged a couple of times too many, while a rescue scene between Henry Turner (Brenton Thwaites) and Carina Smyth (Kaya Scodelario), on the topic of where he has put his hands, is so bereft, it’s painful to watch. Yes, the obligatory young nominal leads. On Stranger Tides should have been a warning that it isn’t just the plankish originals who can come a cropper with starchy, one-dimensional romantic leads, as Sam Claflin and Astrid Bergès-Frisbey, talented both, were stranded high and dry, entirely unmemorable. Here, there isn’t even that luck. The jury’s out on Scodelario (she’s fine in The Maze Runners, forgettable here) but Thwaites proves yet again how entirely eagerly irksome he is (see also the main downside to the otherwise surprisingly enjoyable Gods of Egypt). I guess, to give him his due, he acts Bloom of the screen in their scene together, but so does Lewis McGowan playing Henry’s 12-year-old self, so that isn’t exactly a meaningful gauge. Poor Orlando, reduced to revisiting roles he only won in the first place because he was pretty; now he’s too old to be a pin-up (a shocking 40), he’s left with nothing to fall back on. That the need was felt to return to this well is the most aggravating aspect of Salazar’s Revenge, even if Will Turner is more peripheral than I feared. And, as these things go, it was at least appropriate to bring back Keira for closure’s sake (she still looks very young, of course, because she still is very young), although her bank balance was probably the deciding factor. And yet, it isn’t closure, is it? Despite being heralded as “the final adventure” (not betting on its success, more like, given Depp’s falling star), the post-credits scene sets up a sixth instalment… with Will and Elizabeth back again, properly this time, Gawd help us. It indicates, if indication were needed, that Disney has no idea what makes the franchise tick, and the mistakes haven’t only been down to regular screenwriters Ted Elliot and Terry Rossio. Because Jeff Nathson’s screenplay is frequently doing its best to give you franchise fatigue. This is the first entry without Elliott and Rossio providing the goods (Rossio is co-credited with story), and the at-best oddball edge they brought to their work (Small Soldiers, the first couple of Pirates, Shrek, The Lone Ranger) is largely absent. Nathanson has a clutch of underwhelming sequel credits to his name (including Speed 2, Rush Hours 2 and 3 and Kingdom of the Crystal Skull) and one senses the last thing you go to him for is innovation or inspiration. Thus, the movie’s MacGuffin manages to be both moribund and all sorts of horrible in terms of coherent properties and the logic of its location. The Trident of Poseidon break all sea curses, we are told, so can aid Henry (continuity) in releasing his father (continuity) and Barbossa’s daughter (continuity) in just being plain inquisitive, and Javier Bardem’s Salzar in getting revenge on Sparrow (continuity, of a less severe order, until we get a flashback telling us how Jack got his last name). Also in the mix, the connection of Jack’s compass to the efficacy of curse of the Devil’s Triangle isn’t established in a way that makes any sense. Further, Barbossa must surely know where the Trident is, if he’s the one who produced the diary he gave to his daughter who uses it to navigate to the island of its location? There’s additional, all-encompassing, unnecessary father-daughter continuity right there, quite beside having made Barbossa steadily more ineffectual with each successive instalment; he’s gone from the villain to the compassionate, caring pater (about the one sensible move made here is killing him off; no reflection on Rush’s spirited performance, but including the character each time is unnecessary baggage that bogs down storytelling opportunities). Come to that, Davy Jones’ return (continuity) oughtn’t to be possible, given he was also victim of a now-broken curse (I’m sure it will be written to work, if box office receipts warrant the final final adventure). With these movies, there’s an opportunity to mix things up as much as you want, as long as Jack Sparrow stays the same. Instead, everything remains the same, with interchangeable piratical or admiralty villains. Bardem fits both, pretty much (albeit Spanish navy, rather than admiralty) and aside from strangely swishing undersea locks in open air, he’s easily the least distinctive of the Sparrow’s nemeses. About the only point of note I can summon is how unreservedly bloodthirsty he is, despatching Barbossa’s crew at any opportunity, which at least creates a sense of stakes. David Wenham is an even less important side antagonist as Naval Lieutenant Scarfield, suitably dislikeable, but not inexcusably so since this is mostly directed at Henry, and exiting the proceedings in an unsurprisingly offhand, “did you notice?” manner. Salazar’s Revenge is overlong, despite being the shortest in the series, but at least its all-out CGI climax is one of the better ones (who can forget the interminable finale of At World’s End?) There’s some vibrant visualisation (the ship sailing along the edge of a wall of water) and a sense of grounded escalation, despite the pixels flying about. In general, though, this is very much in keeping with the tone of its predecessors, too much so to stand on its own two feet. That’s unsurprising, as even the US title is virtually indistinguishable from the second instalment’s (I’m guessing that was why Salazar’s Revenge was plumped for elsewhere, despite the resultant glaring title miscue of Salazar’s saying “Dead Men Tell No Tales” only for the title card to be entirely different). Rønning and Sanberg are more than capable of putting together a decent action/chase sequence and weaving humour into the mix, such as the decomposing shark attack/Salazar chase; it’s mainly in the adjunct characters that weariness sets in. Particularly so when bright spots aren’t made the most of, or when it’s recognised that less is more. After expecting the worst, Beckham’s cameo in King Arthur: Legend of the Sword wasn’t nearly as woeful as suggested; the same can be said of Paul McCartney’s here. It’s certainly better than Keith Richards’ in At World’s End (he gets a laugh, for a start, telling a joke with no punchline). In contrast, there’s much, much too little of Golshifteh Farahani’s bewitching witch Shansa, and one can only hope, if they do a sixth, that she’ll be on board (although, that would entail more continuity). Stephen Graham is also good value as crewman Scrum, and certainly garlands the most excruciating moment, as his crewmates attempt to extract one of his toenails to pick a lock. It’s probably fair to say, four sequels in, that very few who didn’t like the previous outing(s) are going to be checking Pirates of the Caribbean: Salazar’s Revenge out, and on that level, like the Transformers series (entries of which I have seen at the cinema: zero), it’s critic-proof by this point. Like that franchise, Pirates’ US box office performance has diminished as international takings have offered compensation, which is unlikely to be as substantial this time out. I’m not all that keen on a sixth bringing Will, Elizabeth and Davy Jones (and the blessed Thwaites to boot) back, but on the other hand, Jack Sparrow; these movies have become akin to the Marx Brothers’ stint with MGM, where you fast-forward through the romance and songs to get to the comic business; while that side still delivers, I’m still game.